Toronto Tamils’ Fine Arts Association presented ‘Bharatha Mile 1000 Dancers – on June 24, 2017, at L’Amoreaux Sports Complex, Toronto. It was a grand performance show cased by the students of 36 Tamil dance and 10 accompanying teachers, in celebration of Canada’s 150th birthday and in support of the Scarborough Hospital. A total of 1117 dancers performed on a beautiful sunny evening that was eye catching and inspirational and making history as the largest dance performance out side of India. 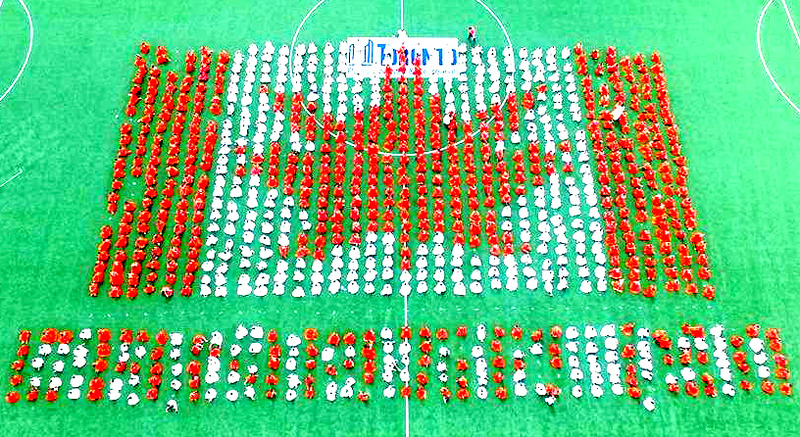 To celebrate the Canada’s 150 Birthday they formed in the shape of a Canadian flag wearing red and white costumes that is also the colour of the Canadian flag. As Michael Mazza, President and CEO of Scarborough and Rouge hospital Foundation said it was a great way to celebrate Canada’s 150th anniversary as well as honour the contributions of Tamil Canadians to the society. 150 singers and musicians aged from 6 to 50 also sang Canadian National Anthem O Canada – both in Tamil and English and Thamil Thai Vazthu in front of thousands of audience. While they celebrated the 150th anniversary they also raised $50,000 and handed over to the ‘The Scarborough hospitals,’ to purchase dialysis equipment. It should be noted that all the dancers contributed $50.00 each towards this collection. The main Dance was followed by a performance from the teachers. perfect opportunity to make my vision a reality. I wanted to hold an initiative that made a direct impact on our community. The Scarborough Hospital has touched us all in many ways and this was one chance to give them back in a meaningful way . It was a great opportunity for all of us to come together in commemoration of our great land, which allows us to truly display our diversity and rich culture.” It was an amazing and moving day to remember and cherish.